Kenneth B. “Ken” Evenson, age 90, formerly of West Washington Street, Port Washington, WI died Saturday, February 27, 2016 at Belgium Gardens, where he called home since August of 2015. He was born on August 20, 1925, son of Albert and Lillian Gullickson Evenson in Scanlon, MN. 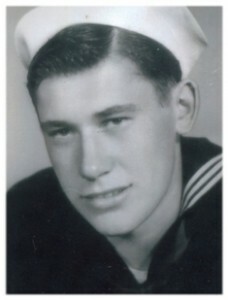 Ken served in the US Navy during World War Two as a coxswain. Upon his return after the war, Ken worked on ore boats on Lake Michigan with his cousin. He was an engine room oiler and did some welding for Navy boats in Sturgeon Bay. He took a welding job at AO Smith in Milwaukee. He later became head of security, retiring after over 40 years in 1991. 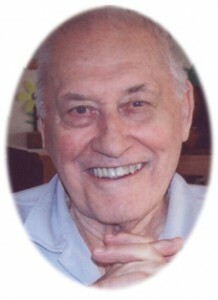 He had been a member of the American Federation of Labor Local 19806 for many years. He raised his family in Port Washington, attending St. Peter of Alcantara Catholic Church. He was always very social, enjoyed golfing and was an avid football fan, especially the Minnesota Vikings. He is survived by his children Greg (Karina) Evenson of Cedar Grove, Mark and Mike (Kelly) Evenson, both of Port Washington, Bonita “Bonnie” Schmidt of Scottsdale, AZ and Marilyn Arnold of Brown Deer. He is further survived by five grandchildren Erik, Leif, Allen and Blake Evenson and Ashley Arnold, 2 great-grandchildren Kailey and Maddox Evenson, his former spouse Katherine Evenson of Fredonia, nieces, nephews, other relatives and friends. He is preceded in death by his two sisters Gloria Anderson and Alice Tillman. Family will receive friends 6-8PM Thursday, March 3, 2016 at the POOLE FUNERAL HOME/Crematory, 203 N. Wisconsin Street, Port Washington, WI. Interment will take place at the Southern Wisconsin Veterans Memorial Cemetery in Union Grove with military honors. Further information and condolences available at www.poolefh.com or 262/284-4431. I am so sorry about your dad passing Bonnie. I have been trying to find you for quite some time. I would love to get in touch with you. Right now I am in Arizona Bisbee are. I will be headed home on the 10th. I had no idea you lived in Arizona. I would have tried to look you up.